Make yourself at home in one of the 57 guestrooms. Satellite television is provided for your entertainment. Private bathrooms with showers feature bidets and hair dryers. Make yourself at home in one of the 51 air-conditioned guestrooms. Dial-up Internet access (surcharge) keeps you connected, and cable programming is available for your entertainment. Bathrooms have complimentary toiletries and bidets. Conveniences include phones, as well as desks and portable fans. Located on the beautiful Island of Sicily, close to the tip of southern Italy, the RG Naxos Hotel boasts easy access to the sprawling beaches of Giardini Naxos. Enjoy traditional Mediterranean hospitality on the rocky coast of the Ionian Sea. Savor the coastline views of Catania or the majestic Mount Etna to the south. 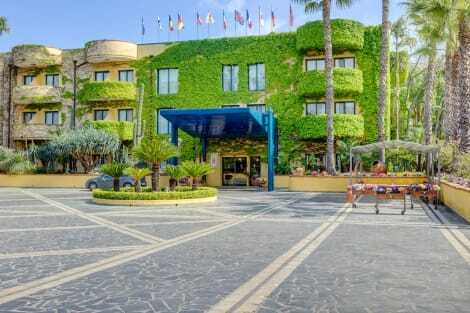 With fantastic rail and road links, the hotel is only 40 minutes from Catania Vincenzo Bellini Airport.Wake up in a stylish and contemporary guest room at this Giardini Naxos hotel and enjoy uninterrupted views of the sea from the comfort of the private balcony. Enjoy a movie on the LCD TV, relax on the comfortable bed or stay connected with high-speed internet access. Make the 24-hour business center your office on the road, equipped with audio/visual equipment and secretarial services. Host a business event in one of 11 meeting rooms with professional staff on hand to assist. Each event venue offers access to the Mediterranean garden and private beach ??? ideal for an unforgettable celebration, gala dinner or conference.Swim lengths in the pool or relax on a sun lounger. Unwind at the Spa & Wellness Center, or work out in the 24-hour fitness center. Play a few sets on the nearby tennis courts. Dine on traditional Sicilian cuisine in at La Sciara, or relax with a drink in the terrace lounge, offering beautiful island vistas. Enjoy lunch at the elegant Panarea Restaurant serving relaxed Mediterranean classics. Pamper yourself with a visit to the spa, which offers massages, body treatments, and facials. If you're looking for recreational opportunities, you'll find an indoor pool, a spa tub, and a sauna. Additional features at this hotel include complimentary wireless Internet access, babysitting/childcare (surcharge), and wedding services. Nestled in Giardini Naxos directly by the sea, UNAHOTELS Naxos Beach Sicilia boasts its own private beach. The establishment has a tennis court, a fitness centre and 4 swimming pools, one of which is Olympic size. UNAHOTELS Naxos Beach Sicilia offers air-conditioned resort with satellite TV, a minibar, and a private bathroom with a hairdryer and free toiletries. The small villas also feature a patio or terrace. The resort also includes bars, restaurants, free private parking, and a boutique. The private equipped beach is available between May and September, and beach towels are also available. During this time there is also an entertainment programme for both children and adults. Relax and enjoy your stay without any hassles, and delight on the half board and full board options, offering a selection of Sicilian and national dishes. Make yourself at home in one of the 57 air-conditioned rooms featuring minibars and flat-screen televisions. Complimentary wireless Internet access keeps you connected, and cable programming is available for your entertainment. Private bathrooms with bathtubs or showers feature complimentary toiletries and bidets. Conveniences include safes and desks, and housekeeping is provided daily. Featuring free WiFi, Hotel Caesar Palace is a modern and unique hotel strategically set only 1 km from the beach, which can be reached with a complimentary shuttle bus. The hotel is ideally located within easy reach of famed points of interest in Sicily, including the cities of Taormina, Catania and Messina. Giardini Naxos itself is renowned for its ancient archaeological sites. All-air conditioned rooms come with a flat-screen TV and a kettle. The bathroom has a bath, free toiletries and a hairdryer. You can start your day with a sweet and savoury buffet breakfast.The complex has its own restaurant with buffet service, a grill and pizzeria by the swimming pool (open in summertime) and an a la carte gourmet restaurant. Professional entertainment staff is available from July to September. This property is 17 minutes walk from the beach.